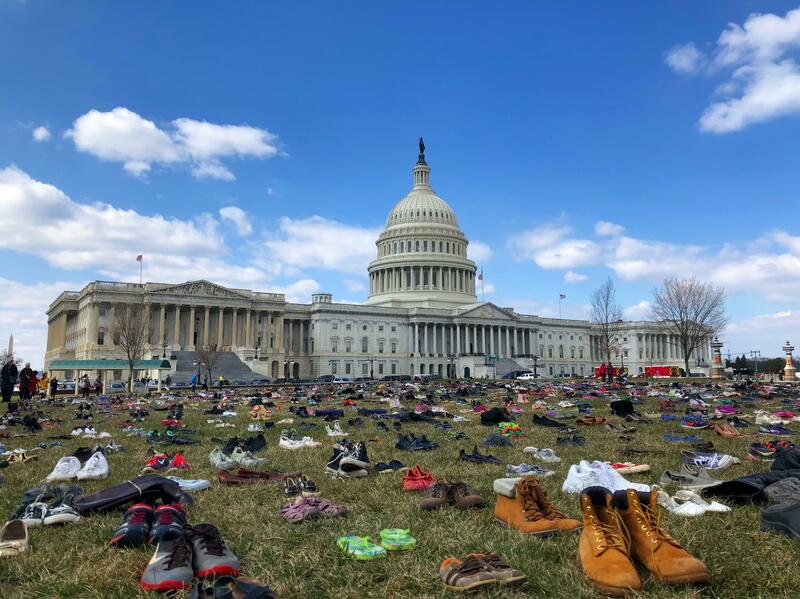 CBS affiliate WUSA reports that the group based the protest on research from the American Academy of Pediatrics that found approximately 1,300 children are killed by guns each year, or about three every day. A pair of turquoise blue cowboy boots stood next to a photo of Allison Parker, a 24-year-old reporter who was fatally shot on live television in 2015. Her parents looked at the boots with a mix of grief and nostalgia. "You can just remember her smile," her mother Barbara said. "It could just light up the room." The Parkers were among the dozens of volunteers at the Capitol calling on Congress to take action. The protesters held up a sign that read "#NotOneMore." Lori Haas also spoke of her painful memories Tuesday. Haas began advocating for gun control in 2007, when her daughter was shot and injured at Virginia Tech. "I remember getting the phone call from Emily the morning of April 16," she said. "And she said, 'Hi, Mommy. I've been shot.'" Haas' daughter survived the massacre, and since the shooting, Lori has called on Congress to take action. "The numbers are so gross in this country," she told WUSA. "Any other cause of this carnage would be pounced on by the Congress. It's a moral failing on their part."